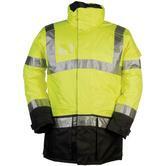 Sioen Lightflash 313A Winter Rain Jacket. Zip closure under press studded flap. Sleeve narrowing by touch and close fastening. EN 343 : 2003 + A1 : 2007 Class 3-3. EN 342 : 2004 Class 3-2. Peltor's Forestry Package G3000 The package comprises helmet, visor, hearing protector and rain protector. It weighs only 660 grams and has been tested and certified according to EN397. 3M Peltor Forestry Package G3000 conforms to: EN397, EN352-3, EN166, EN1731 safety standards. This combo helmet has a comfy 6-point suspension harness with fully adjustable slip-ratchet headband. 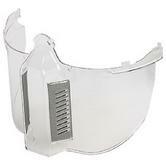 Wire mesh visor protects against flying debris such as saw dust or chips. The hard wearing helmet gives the user protection from falling objects such as tree branches and other falling hazards. Suitable for forestry, strimming, agricultural and chainsaw use where there is a high risk of facial injury. 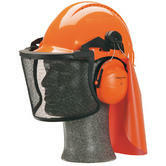 Ear defenders protect against chainsaw noise or other load noises from machinery nearby. A top class product that will give many days of vital protection. 1 x Mesh Face Shield with Mount. Chainsaw Brush Cutter Forestry Helmet Combination with Mesh Guard and Earmuffs conforms to EN397, EN352-3, EN166, EN1731 safety standards. Flexicord Safety Cord for honeywell Spectacles, black. Practical cord to help keep safety eyewear close by. 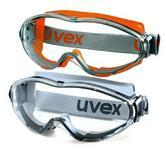 The design of these Uvex Ultrasonic 9302 safety goggles has evolved from the sporty, aerodynamic shape of ski goggles. These are a Wide-vision, panoramic goggle. The indirect ventilation gives excellent wearer comfort. These Ultrasonic 9302 goggles use Uvex Supravision lens coating technology: an anti-fog coating on the inside, and scratch resistant on the outside. These are able to be worn over most prescription glasses. They have a high quality, fully adjustable head strap, offering a pressure-free fit. The combination of hard and soft components adapt to the wearer's face, creating a soft, effective seal around the eyes. Uvex Codes: 9302245 for the Orange goggle and 9302285 for the Grey/Black goggle. Certified to EN 116 (moving particle protection) and EN 170 (UV filter protection) and EN 172 (Sunglare protection). NB we also have the Welding version of this Ultrasonic goggle available: 9302 247. For use with Uvex Ultravision safety goggles. Unique lower face polycarbonate shield that attaches to the Ultravision goggle providing increased protection to the wearer. It provides increased facial protection for the user. The face shield offers general protection against over-spray, not designed for medium energy impact protection. Uvex 9301.317 Ultrashield Face Protection certified to: EN166 B. 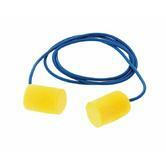 Soft & comfortable PU earplugs from Blackrock. 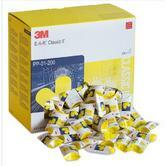 Effectively reduces noise and harmful sounds, and are simple to insert and remove. Ideal for any workplace. Conforms to EN352-2. 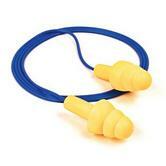 Conclusion: great value earplugs, with 37bd SNR sold in box of 5 pairs. Howard Leight MAX offers superior noise-blocking performance in a single-shift disposable earplug. The Howard Leight 3301130 Max by Honeywell uses soft foam to give long-wearing comfort and performance. The smooth soil-resistant skin offers excellent protection from dirt, and the bell shaped design makes insertion and removal quick and simple. Howard Leight 3301130 Max enhanced contoured shape is easier to insert and resists backing out of the ear canal. Clarity 656 multiple-use earplugs use advanced manufacturing technology to deliver a revolutionary combination of all-day comfort and easy handling. Its FlexiFirm core ensures easy insertion into the ear canal and a superior fit all day long. Clarity's patented SoftFlange design adjusts perfectly to the ear canal to deliver unmatched comfort and superior attenuation. Patented design blocks low and medium frequencies while higher frequencies (voice, signals, and alarms) can be heard more naturally, with less distortion. Low attenuation ideal for marginal noise environments of 95 dB or lower, preventing overprotection and improving overall worker safety and compliance. Patented quadruple SoftFlange design creates comfortable seal in the ear canal for all-day comfort. Reusable case with hook allows wearers to attach to belt loop, apron, bag or other work tools. 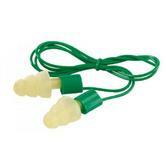 Honeywell Clarity 656 L Reusable Ear Plugs conform to: EN 352-2:1993, EN-24869-1:1993 safety standards. The bright idea in hearing protection, Laser Lite’s low-pressure polyurethane foam expands gently inside the ear canal for comfortable long-term wear, while its contoured T-shape delivers easy handling. Plus, Laser Lite is available with special packaging and dispenser options, ideal for process industries with low tolerances for packaging waste. 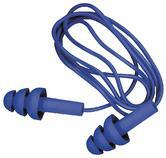 Howard Leight LL-1-D Laser Lite Uncorded Earplugs conforms to: EN 352-2:1993, EN-24869-1:1993. In this category you can find a great variety of Chainsaw protection Workwear, we stock Workwear from only the best manufacturers such as SIP, Sion, Bally Clare, 3M, Portwest, Uvex, Honeywell and many more with our stock constantly growing. Many of the products found here have been manufactured from a polycotton combination like the Portwest CH10 Chainsaw Jacket, allowing them to endure against tears, cuts, abrasions, water and even chainsaws. The special materials used are capable of jamming/clogging the blades on a chainsaw preventing a serious accident. The SIP Chainsaw Protection Trousers 1SP2 is the perfect example of this. Chainsaw Workwear is ideally used for forestry work, along with any other general tasks as they are water resistant, durable and comfortable. Our Chainsaw protective gear conform to many different safety standards including EN 381-5 - Class 1 Chainsaw protection, EN471 Class 3 Highest Level of High Visibility, WR Water Resistance and EN381 Chainsaw Protection. 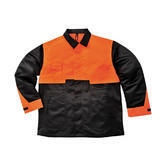 The SIP Forestry Jacket 1SK7 is one of the many that conforms to these safety standards , achieving the highest levels of protection guaranteeing your safety. In this category you can also find other Chainsaw protection accessories such as Goggles, earplugs, ear muffs and helmets. 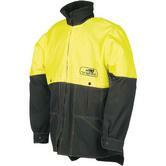 These products provide exceptional protection during chainsaw / forestry work. For more information about Chainsaw safety standards have a look at our Chainsaw Safety Standards Blog.